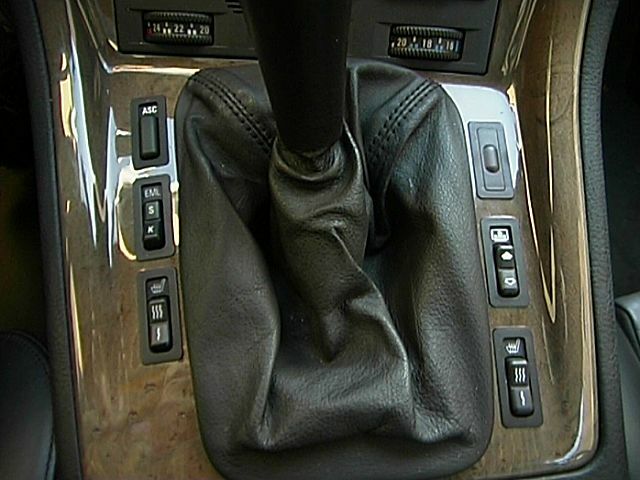 The BMW 850CSi was fitted with a manual gearbox only. The Automatic Stability Control plus Traction (ASC+T) improves driving stability, perticularly when accelerating and cornering. It prevents the driven wheels from spinning when driving conditions are unfavourable and ensures that the maximum possible amount of power can always be transmitted through the tyres to the road. The system is ready to operate whenever the engine is started. When the telltale light in the instrument cluster flashes, the system is active, that is to say it is compensating for fluctuations in traction caused by the road surface. If the system is switched off, the telltale light is lit all the time. the car's tilt angle is changed, for instance if it is towed away or jacked up in order to remove the wheels. The system is activated and de-activated whenever the deadlock is operated at the door lock or with the remote control. The electronic power control (EML) which takes the place of a conventional accelerator linkage has two programs: sport and comfort (S and K). K: Comfort setting, for driving at moderate engine power or on a wet and slippery road. S: Sport setting. Only the S setting is shown on the instrument panel. The EML does not switch off a cylinder bank, although the engine is capable of it, for instance at malfunctions of a catalytic converter. The BMW 850CSi has an electronic throttle, so its position will just be interpreted differently. The rocker switch operates the electric roller sun blind for the rear window. The seat base cushion and the seat back can be heated when the engine is running. |||: Rapid heating while the symbol is illuminated. Automatic changeover to regular heating. |: Regular heating. Cuts out automatically when the switch is no longer illuminated. To switch over while heating, press the non-illuminated position of the switch. To switch off prematurely press the illuminated section of the switch.